NOTE: This section changes frequently. We have many plates and other dishes to add. Please check back often. 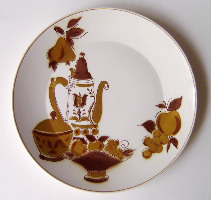 We have 5 dinner plates, 10 1/4 inches, with brown fruit and leaves in the Mikasa pattern of Focus Shape Mocha. With the holidays approaching, can you imagine they are just around the corner -- these plates will complete your set. On a major replacement site, these 60's plates sell for more than $16.00 each. We offer them for 9.99 each.